Warthogs are sparsely haired with a long and bristly mane down the neck to the middle of the back. The legs are relatively longer than most pigs. Males have 3 pairs of “warts,” 1 near the eyes, 1 on the snout and 1 pair on the lower jaw. The female’s two pair of warts are smaller, with none on the snout. The eyes are set high on the head. They have a typical pig’s disc-like nose pad. The hooves are relatively small, with four toes on each foot. Digit 2 and 5 are reduced, more so on the hind. They have a relatively long, tasseled tail. Warthogs use grasslands and open woodlands across most of sub-Saharan Africa. The Desert is on the Ethiopia/Somali border south into Kenya. The Common is widely distributed across Central and most of Southern Africa. Both species occupy areas much drier than other pigs, but the Common – apparently – does not inhabit the drier range of the Desert Warthog. Regardless, they are usually within walking distance of water. Wild – Warthogs, more specialized than most pigs, are primarily grazers. They do root, taking bulbs, rhizomes and various worms and insects. Zoo – Grass hay and alfalfa, vegetables and greens. Warthogs are over-all gray but may look red or some other color from wallow-ing. Young animals have white wart whiskers. Newborns have a hint of striping. Warthogs are diurnal. Their temperature tolerances are limited and a deep burrow is essential. The burrows are used for protection from fluctuations in temperature and humidity as well as predators. The young go into the burrow head first, as they are able to turn around inside, but the adults back in – weapons facing out. Warthogs can dig but a used burrow is preferred. Most abandoned burrows created by Aardvarks are taken over by Warthogs. Warthogs prefer short succulent grasses, which they pluck with the lips and “unique” incisors. Longer grasses are pulled with the teeth. The tusks are not used to dig. The hard-edged, well-muscled snout is used to root food, particularly during the dry season or after fires. Warthogs do wallow. Coating the body with mud acts as insect repellent and sun screen. The tail is an effective fly-swat and it telegraphs mood. They run with the tail standing straight up. If the mane is raised, it is for intimidation. The mane is laid down flat in appeasement. In friendly encounters, they greet nose to nose. All pigs are highly vocal. Home range territories and other members of one’s band are marked, with preorbital glands. They live in groups of females and young. With safety in numbers, several families may travel together. The band associations are loose. Sexually active males are primarily solitary while non-breeding males form bachelor groups. Because of their rather long legs, Warthogs are quite fast if they have to run. They kneel to graze and usually rise hind quarters first to stand. Callosities, present on the carpal (wrist) joints, are not just calluses, they develop before birth, much like those in camels. The eye-placement, high on the skull, allows for keen vision even when kneeling. Pigs generally have a simple stomach, much like humans. Pigs have bunodont teeth, also similar to humans, with fairly high crowns. As the animal matures, however, warthog premolars are lost and the 1st and 2nd molars regress. The 3rd molar moves forward and enlarges. Older animals have one huge molar in each jaw. Tusks are ever-growing canine teeth. Tuskless sub-adults, especially males, have white hair tufts on the lower warts that are lost as the animal matures. Why is not known and one author suggests they give illusion of tusks. However, a sub-adult would not want to advertise tusks if he was not ready to spar. Perhaps the illusion is for predators. Vision is poor but hearing and sense of smell are excellent. Warthogs scent-mark with lip glands and preorbital glands. The upper tusks grow out, up, and around the snout. The lower tusks are short and sharp. Both tusks are triangular in cross-section. The short, stout, lower tusks are used for defense. With the mouth closed, the upper and lower tusks occlude together, forming a diamond and the upper tusks are thus back-stopped during the ritual sparring. Females sometimes spar also. Warthog warts serve to protect the eyes and jaw from the hammer-like punches delivered during ritualized head duels. Contests of strength are usually tusk-to-tusk and forehead-to-forehead pushing matches. Low sideways blows are wicked and violent fights are bloody, but such escalations are rare. These sorts of mouth-open blows are usually reserved for confrontations with predators. Lower tusks are sharp weapons that will produce huge gashes. The mouth is usually kept closed during ritualized sparring, with the upper and lower tusks clamped together. Breeding is heralded by lip-gland pheromones. Gestation is 170-175 days and, even though the female has 4 mammae, she usually delivers only 2 precocial piglets. She leaves them in a grass-lined burrow during the day, returning 2 or 3 times to suckle them. They emerge from the burrow at 2 weeks, but stay close and dive back in if alarmed. They eat grass almost immediately and, keeping close physical contact with the mother, they begin to follow at 6 or 8 weeks. They are sexually mature at about 18 months, but males do not breed for about 4 years. They have to earn the right by physical prowess, and their tusks are not well developed until about 5 years. Wild longevity is up to 10 years, but 15 or more in captivity. Lifespan 15 years in the wild. Diet Warthogs, more specialized than most pigs, are primarily grazers. They do root, taking bulbs, rhizomes and various worms and insects. 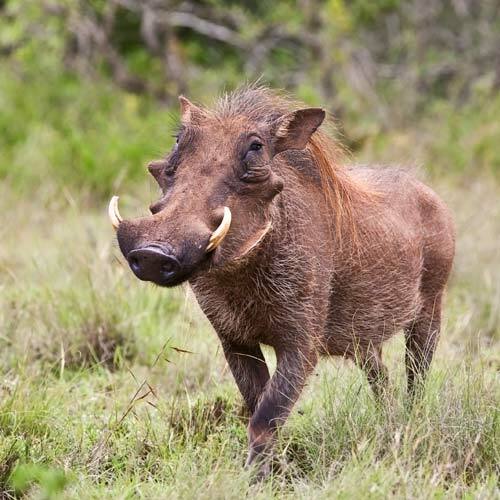 Despite some eradication campaigns, Warthogs are IUCN listed as Least Concern. Without symptoms, African pigs carry ASF (African Swine Fever), a viral disease lethal to domestic swine. They also host trypanosome carried by the tsetse fly (“sleeping sickness” in man and ngana in livestock). Warthog warts serve to protect the eyes and jaw from the hammer-like punches delivered during ritualized head duels.